Awwww She's soooo sweet. Her face is perfect. I love her toys too. Did you make that little dog? He's wonderful. Es preciosa, como todos sus bebes. A mi también me gusta mucho el perrito. Es un bebé precioso, con una expresión muy dulce y abrazado al perrito de juguete. Me encata. She's gorgeous! LOVE her stripey top and those little leggings! Oh Patty, I really love this little one! Such a sweet face, and the little outfit is adorable. LOVE her little teddy and puppy too! Thank you so much for the comments. I really love her clothing too and she has a tiny button on her shirt that says I (heart) Bears. 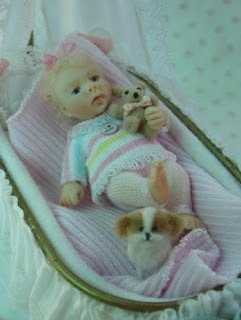 The dog is one of my favorites and was made by Teresa Summers who is an IGMA artist. He loves to be photographed! ¡Muchas gracias! Me encanta el perrito también. Lo compré de Summers Teresa. Ella es una artista IGMA también. Besos!!! Anyway - you don't have to worry about your cute baby with this watchdog. Es adorable!! y el perrito también! que caritas más dulces las de ambos.Un beso. Patty!! es lindisima!!! me encanta, como todo lo que haces. This is a lovely and sweet little girl. She seems very contented with her bed. I like the way you dressed her. El bebe con el perrito, queda muy dulce, enhorabuena!!! !